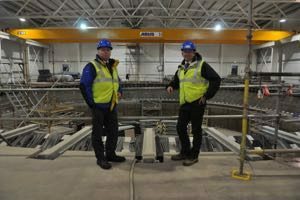 FloWave is a 25 metre circular test tank which is the only facility in the world with the capability to generate complex waves and fast tidal currents from any point of the compass. After three years of work by Sam Draycott – a dedicated research engineer working at FloWave – and the support of the highly experienced team at EMEC, FloWave can now accurately replicate individual project site locations within the tank to a level of sophistication and complexity not possible anywhere else in the world. Making full use of both the 10-year plus data-set from EMEC’s Billia Croo offshore test site and the multi-directional wave and current capability of the FloWave test tank, the new technique has already been trialled and tested by engineering consultants Quoceant, a company with significant experience in testing in real wave climates, and at Billia Croo in particular. Founding director of Quoceant, Richard Yemm, said: Quoceant carried out tests at FloWave as part of the development of our variable hull volume technology, which may be applied to many different types of wave energy converter, and enables change of hull volume on demand to improve both performance and survivability. From our experience testing real machines at EMEC we know first-hand that most test tanks just cannot produce sea conditions like those found in an open ocean site. The circular tank now operating at FloWave allows much better emulation of real conditions and it was exciting to test in storm waves that actually occurred on the EMEC site! This capability goes a long, long way to closing the gap between laboratory tank testing and the real world.” (See time-lapse video at end of article). The ground-breaking project began when Neil Kermode, Managing Director of EMEC and Stuart Brown, CEO of the FloWave, were discussing the significant learning gap and other difficulties that companies were experiencing in stepping out of test tanks and into the real sea. At that time the FloWave facility was nearing completion of its build phase, and both facility directors saw the opportunity to use the unique capability of the test tank to help developers prepare for real-sea deployments by testing in scale conditions as close to realistic as technically possible. Neil Kermode said: “FloWave has done a great job at integrating our data into their test tank, and I’m delighted to hear that Quoceant has been able to trial this. The open ocean is an expensive place for developers to learn hard lessons so realising the conditions experienced at EMEC in a tank should help iron out some issues before they come to deploy at sea. “Having established the tools and process with EMEC’s Billia Croo as a first example, FloWave now has the capability to work with appropriate data-sets from other project site locations around the world,” Kermode concludes. “The biggest challenge for any developer is really understanding the likely behaviour of a device or project in a specific location, and this includes survivability challenges as well as efficient performance in more normal operating conditions,” says FloWave Chief Executive Officer Stuart Brown. “In the wind sector developers erect met-masts or deploy LiDAR instruments to better understand local site wind conditions, and this is used to inform turbine choice, energy yield output predictions, O&M strategies, insurance premiums, and more,” Brown continues. “This brings enormous benefit for developers in terms of anticipation of, and preparation for, the challenging complexities of deployment in the real marine environment, and I am really proud of Sam and the team at FloWave for achieving this major step-change in test tank capability alongside our regular work-stream of carrying out test campaigns for commercial and academic users,” Brown concludes. EMEC and FloWave are the most advanced test facilities of their kind in the world. Through this and other collaborative projects they are making each centre’s offering even more compelling – and together they ensure the UK and Scotland remains the world’s foremost destination for ocean energy research, testing and demonstration.